Natalie Sabanadze is the ambassador to the Kingdom of Belgium and Grand Duchy of Luxembourg and the head of Georgian Mission to the EU. 9 April 1989 was a day when the Soviet Union crumbled in disgrace in Georgia. Thousands of peaceful protesters, mainly young people, had gathered in the central square of the Georgian capital Tbilisi, protesting the Soviet rule and voicing various demands ranging from greater autonomy and pluralism to full independence. They took advantage of newly acquired freedom of expression brought about by Gorbachev’s reforms, believing that through peaceful protest their voices would be heard and Georgia could be liberated. National independence movement had been gaining momentum since the late 1980s and student protests became a commonplace. In the early Spring of 1989, such protests often accompanied by hunger strikes began to take a greater proportion than Moscow could tolerate. In the early hours of April 9, Georgian Patriarch Ilya II addressed thousands of demonstrators and warned them of imminent danger. He pleaded them to disperse but to no avail. Excited young protesters chose to continue, waving flags of the First Georgian Republic and calling for the end of the Soviet occupation. At the crack of dawn, Soviet tanks rolled into Tbilisi, closing off the central city and allowing special forces of the Soviet Ministry of Internal Affairs (MVD), armed with trench spades, clubs and CS gas to encircle the demonstrators and brutally crush them. They left 21 dead, 18 of them women, and 427 injured. This was a defining moment in Georgia’s struggle for liberation. Whatever was left of Georgia’s intellectual and cultural bond with Russia and of popular belief in Perestroika was all but destroyed. It became clear that Gorbachev’s regime was just as steeped in blood as that of his predecessors and the late Soviet Union was a police state in agony. After the tragedy of 9 April, the local communist government completely lost moral legitimacy and with it, the authority to govern. Moscow introduced the curfew in an attempt to contain protests, but the revolutionary mood in Georgia swelled in response. Images of young women crushed under the Russian tanks and thousands of people suffocating with deadly gas scarred Georgians at a time and only intensified their determination to fight the aggressor. Demands of national activists became more radical and Georgia’s staying in the Soviet Union was out of the question. 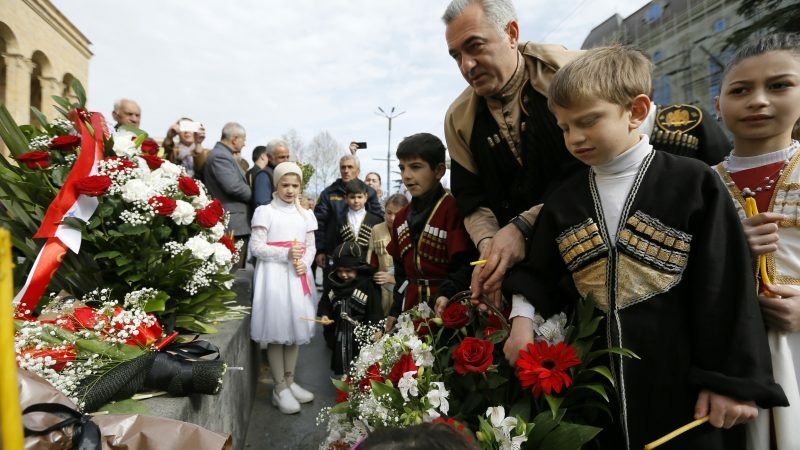 Two years later, precisely on 9 April, in a symbolic move, memorialising the tragedy, Georgia proclaimed its independence from the Soviet Union. Today, thirty years on, Georgia remembers its heroes and celebrates the restoration of its independence. It looks back at those tumultuous times, trying to come to terms with consequences of the tragedy and to asses them from the perspective of history. Memories, however, are still fresh and emotions raw, which is why it will take longer than 30 years for the dust to settle over 9 April 1989. It is clear, nevertheless, that it was the date when the Soviet Union collapsed in Georgia, when freedom became a necessity and when a choice of returning Georgia to Europe was made unequivocally. Governments have come and gone since then and the country went through many ups and downs, trials and tribulations, slowly to emerge as a functioning, democratic state. However, the fundamental choices made thirty years ago about the value of freedom and about the need to secure Georgia’s place amongst civilized family of nations has never changed. Thirty years on, Georgia’s sovereignty and territorial integrity are still challenged by Moscow but its determination to succeed, to break away from the Soviet past and build a European future, whatever the cost, is as strong as ever.